Bread is not merely a staple. For many, it is a passion. For those less poetically minded and more fiscally minded, this means that the creation of bread is a stable business or career choice for those who are adept in the hand manufacture of goods. The duties of a baker are particularly simple. A baker bakes. Whether this is bread, rolls, pies, flatbread, or otherwise, the baker is a specialist in the production of baked goods. Still, with specialization comes the need for you to learn the specialty. For bakers who want to get started, the first thing to note is that food is regulated at the county level, making it difficult, if not impossible, to predict just how the particular eccentricities of the area will factor into your profession without actually going out there and checking yourself. For example, in New York state alone, some counties forbid the manufacture of retail baked goods in any residential kitchen, while some allow their manufacture only if none of the items for sale contain ingredients that require refrigeration. Still others forbid there to be pets in the household, while other, very strange rules allow their manufacture in such a locale only if a door to the outside is present in the kitchen. Thankfully, once that hurdle has been cleared, all you need to do to become an independent baker is to acquire a bakery license for off-site sales and get to it. 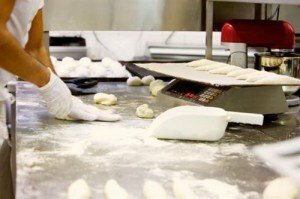 Once successful, you can move up to a location with professional equipment that sells directly on-site, like many small bakeries do. For those looking to become bakers in the employ of others, note that the production of such a staple is not a glamorous or even high-paying job. The average wage for a baker comes in at a touch under $9.00 an hour, putting it well below living wage. Still, the requirements are for landing a job are really quite simple. Those who are obsessed with credentials tend to follow the money, after all, so the market has yet to saturate careers such as the baker with the need to jump through excessive numbers of hoops to become employed as one. To get an entry level position as a baker, all you really need is a high school diploma, and even that is not required, but rather recommended. With four years of experience and the successful completion of a written test, a baker can become a Certified Journeyman Baker, or CJB, through the International Guild of Hospitality and Restaurant Managers. With eight years of experience and the successful completion of a pair of tests, one written, one practical, a CJB can become a Certified Master Baker, or CMB, through the Guild.